Published on March 16, 2016 in General T&T, International and Labour. 4 Comments Tags: ANR Robinson, ArcelorMittal, NAR, Politics, Raffique Shah, Steel, T&T Govt. Trinidadians are hell, I tell you. Take their almost instantaneous sympathy with the 600-odd steel workers who found themselves jobless last week when ArcelorMittal shut down its plant in this country. Sure, that means at least 5,000 family members facing very uncertain times if not utter devastation. Those who have mortgages or rentals could lose the roofs over their heads. Vehicles may be repossessed. Children’s education will be at risk, in particular those who attend university. And ultimately, putting food on the table might be a challenge. Published on June 14, 2015 in Elections, General T&T, Labour, Opposition Party, People's Partnership, PNM, Politics, Race and Identity, Racism Watch and UNC. 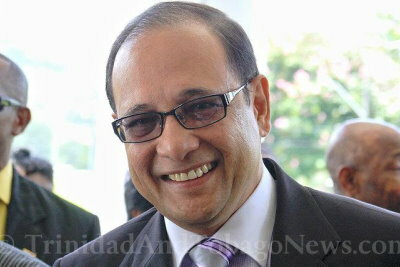 10 Comments Tags: CEPEP, Kamla Persad-Bissessar, Politics, Raffique Shah, T&T Govt, URP. As she enters uncharted territory seeking a second term in office, the Prime Minister exudes a measure of confidence that is at odds with a widely-held perception that her People’s Partnership coalition will lose the general election. She and her ministers have made it clear that they plan to campaign on performance, which they hope will mute charges of corruption, waste and scandal that were deafening during the past five years. How is applying for an A2 Visa Breaking US Law? Published on January 24, 2014 in General T&T, Labour, Law and USA. 1 Comment Tags: Politics, T&T Govt, USA. Foreign Minister, the Honourable Winston Dookeran posits that were the T&T Consulate in New York to continue to apply to the State Department for the granting of an A2 US Visa on behalf of a member of its locally recruited staff (LRS), that would “breaking US law…” Well the Consulate under different regimes in POS has been applying and the State Department has been granting these A2 visas or variations of stays to it and many other foreign consulate accredited to the State of New York. Published on November 24, 2013 in Africa, General T&T, India, Labour, Race and Identity and Racism Watch. 13 Comments Tags: African, Racism, Selwyn R. Cudjoe. Gerad Tikasingh has written an interesting book, Trinidad During the 19th Century: The Indian Experience, an extension of his doctoral thesis, “The Establishment of Indians in Trinidad, 1870,” that he completed at UWI, St Augustine, Trinidad in 1973. Although his book is filled with facts, it is marred by an ideological orientation (one may say Indo-centric perspective) and a negative rendering of the African experience in the country. This book continues an argument made by other Indo-Caribbean scholars that suggests that the dominance of an Afro-centric ethos (which Tikasingh calls a “black bias”) has “tended to downplay, if not obscure the parallel Indo-Caribbean experience of indentureship and its contributions to Guyanese and Trinidadian culture in particular” (see Frank Birbalsingh, Indo Caribbean Resistance, 1993). Published on August 25, 2013 in Crime in T&T, General T&T, Labour, Police, Politics, Protest and Security. 17 Comments Tags: COP, Crime in T&T, Police, Politics, Raffique Shah, T&T Govt. Not since late Commissioner of Police Jules Bernard publicly declared, “I’m a toothless bulldog!” have I heard so many outlandish statements coming from the mouths of senior officers of the Police Service. “Criticism hurts,” screams Acting CoP Stephen Williams. Yet, Williams and his most senior officers say and do the most ludicrous things, inviting not just criticism, but oftentimes, bellyfuls of laughter. Published on June 23, 2013 in General T&T and Labour. 5 Comments Tags: labour Day, Raffique Shah. I MONITORED this year’s Labour Day celebrations with mixed feelings. I was sorry to have missed the annual pilgrimage to the shrine of organised labour for the fourth year, but that’s another story. I felt a deep sense of nostalgia, a longing for the glory days when we rocked Fyzabad with solidarity that stretched for miles. Now, I see labour-power diminish before my eyes, something I thought would never happen in my lifetime. Published on May 19, 2013 in Food, General T&T, India, Labour, Media, Opposition Party, People's Partnership, PNM, Politics and UNC. 3 Comments Tags: Anand Ramlogan, Attorney General, Basdeo Panday, Caroni Ltd, Kamla Persad-Bissessar, Politics, T&T Govt, UNC. THE CLOSURE of Caroni (1975) Limited and consequent devastating impact on the agriculture sector and TT’s food security, may be directly linked to political considerations surrounding the then PNM government’s fear of a repeat of the 18-18 general election deadlock of 2001, Tourism Minister Stephen Cadiz said yesterday. Published on March 1, 2013 in General T&T, Labour, Media, Opposition Party, PNM, Politics, THA and Tobago. 6 Comments Tags: Abuse, Guardian, Politics. There is great cause for concern over the news that the Tobago House of Assembly (THA) plans to appoint former secretary of finance and enterprise development Dr Anselm London as a senior consultant in his former division, which is now headed by the recently elected Joel Jack. Dr London, a man of advanced age, who stepped down ahead of January’s THA election after serving in the position for more than 11 years, is the cousin of Chief Secretary Orville London. That alone raises questions and is generating considerable discomfort. 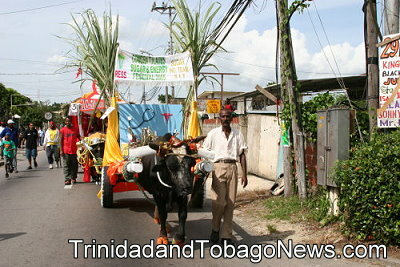 Published on October 7, 2012 in General T&T, International, Labour and USA. 8 Comments Tags: Joe Young, Raffique Shah, USA. LAST Tuesday, one of this country’s great labour leaders and patriots, Joe Young, made his exit from life. Not a drum was heard, not a funeral note, as this gentle giant was hurried to some morgue, unmarked and indistinguishable from others. Not that he would have wanted otherwise. It was his final interaction with the ordinary man with whom he lived and mingled freely, for whom he fought many a battle. At age 80, Joe must have endured more than he could in this cussed country that he so loved. He was ready to join his ancestors, to re-link with old comrades. Published on October 2, 2012 in Business, Crime in T&T, Finance, General T&T, Labour, Law, Media, Parliament, People's Partnership, Politics and Security. 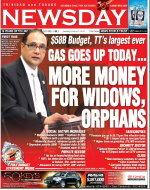 5 Comments Tags: Budget, Budget 2012, Crime in T&T, Jack Warner, Kamla Persad-Bissessar, Larry Howai, Politics, T&T Govt. PEOPLE who drive vehicles fueled by premium gasolene will pay higher prices at the pump from today. A wide range of hefty tax increases was imposed on the local gaming industry as of yesterday and land and building taxes will return. However orphans, retirees, special reserve police officers and persons involved in home construction are just some groups in society who will benefit from the country’s largest ever budget which Finance and Economy Minister Larry Howai presented in the House of Representatives yesterday.